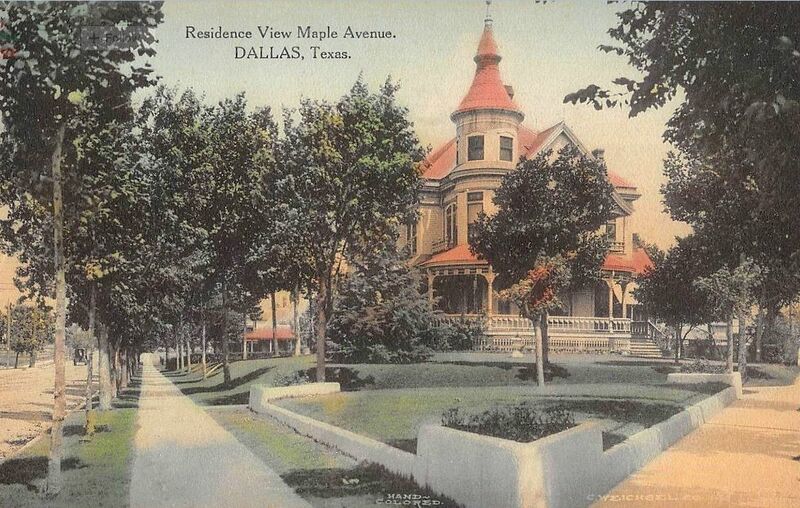 When the fashionable and wealthy began to move their residences north from the downtown area, they built their homes along Maple Avenue, between McKinney and about where the Stoneleigh Hotel now stands. This exclusive neighborhood of imposing houses hit its stride in the first decade of the 20th century. I hate to write this paragraph because some people may think I had a pernicious influence on the neighborhood. But there were five men living on Maple between McKinney and Cedar Springs who committed suicide in the 1900s. Not all in one day, or one week, or one month, of course, but over a period of years. Wow. The distance between McKinney Avenue and Cedar Springs is only two-tenths of a mile! Paragraph from Diaper Days of Dallas by Ted Dealey (Nashville: Abingdon Press, 1966), p. 39. Click postcard to see larger image. I have a copy of Diaper Days of Dallas. Such a wonderful book! This post made me want to read it again. I love that book. One of the reasons it’s so interesting is that he will talk about everyday things that people never think to describe, like how one got off and on a streetcar. There was a part of the book that described an early Dallas tradition, a sort of costume ball. I remember thinking how cool it would be to have kept that going, or if someone would revive it. Similar to Battle of Flowers / Fiesta in San Antonio. Yeah, that was the Kaliph’s ball and parade, which I’ve been meaning to write about. Much as I enjoyed the book, I did grow weary of ol’ Ted’s inordinate fondness for the word “inasmuch” — he must have used it 50 times!